Governor of Pennsylvania, 1919-23, was born .4 mile SW, in 1870. The house is marked. His term is noted for road building, the Edmonds Act improving the public school system, and the creation of the Department of Welfare. He died near Chester in 1928. 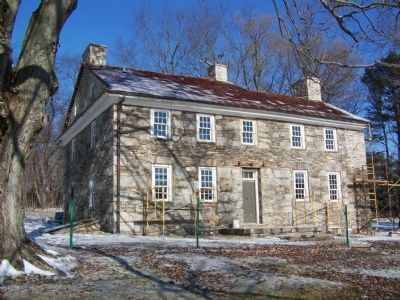 Erected 1951 by Pennsylvania Historical and Museum Commission. Location. 39° 52.255′ N, 76° 0.264′ W. Marker is in Christiana, Pennsylvania, in Lancaster County. 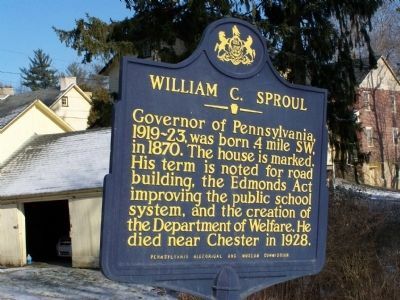 Marker is at the intersection of Georgetown Road PA896 and Sproul Road, on the left when traveling east on Georgetown Road PA896. Touch for map. Marker is in this post office area: Christiana PA 17509, United States of America. Touch for directions. (approx. 5.9 miles away); Hosanna Meeting House (approx. 5.9 miles away); A Job on the A & S (approx. 6 miles away). Touch for a list and map of all markers in Christiana. More. Search the internet for William C. Sproul. Credits. This page was last revised on June 16, 2016. This page originally submitted on February 24, 2008, by Bill Pfingsten of Bel Air, Maryland. This page has been viewed 1,394 times since then and 9 times this year. Photos: 1, 2. submitted on February 24, 2008, by Bill Pfingsten of Bel Air, Maryland.